I made this sweet baby doll cake using the Wilton doll cake tin. I sliced the cake and filled it with buttercream icing and coated the outside too. I then left to chill. I pre-prepared the cake drum with a quilt pattern. I then covered a baby doll body with fondant and gave her a bow. Next, I covered the base in fondant and put the body in the cake. I used a cutter to cut circles which I then frilled with a ball tool. They were cut into strips and applied to the cake. 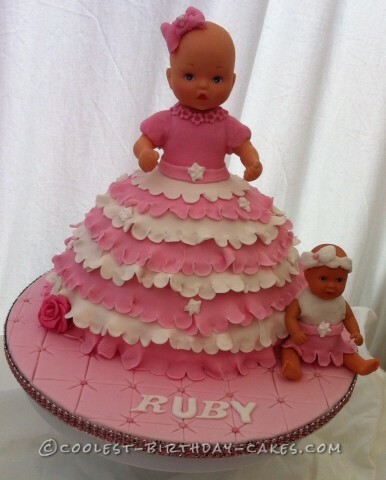 I was delighted with the finished baby doll cake.